What’s the Best Way to Start Off a Swim Season? A new swim season is about to start, and in the process of preparing my annual training plan I decided to investigate how other swim teams and other sports team start off their seasons. After all, I’ve borrowed enough ideas from cycling and other sports that its possible they have some good ideas in this area as well. What I found was a bewildering and scary variety of ways to start a season. I’m sure not all of them are relevant to swimming, based on significantly different use of energy systems, length of the sport’s season, and individual goals of the coaches, but it still surprised me. Early season training theories can be broken down into three broad categories. This category was easily the most common one when looking across sports. Interestingly, the emphasis typically comes with a complete acknowledgement of a relative lack of focus on technique. The idea seems to be to get them in shape, and then worry about technique later. For land-based sports this often involves a LOT of running, which makes sense if the running technique is already sound, or of relatively little importance to the sport. Surprising to me, many swim teams adopt this attitude as well. There doesn’t seem to be much concern about pounding out the swimming distance without ensuring proper technique. An extreme variation of this is the hell week. It’s amazing to me how many sports teams start off the season with a hell week. Everybody from high school football to local hockey teams to university sports teams like to start the season off with a complete shock to the system. I was surprised to find out that a local non-swim team just started out their season with a hell week, with a first practice that involved up to 2 hours of running including stairs. From the sound of it, the quality of subsequent practices dropped sharply after that, so I’m not sure what that accomplished. The US Navy SEALs have a much harder variation of this with their insanely demanding SEAL training. And even though these incredible athletes / soldiers are already in phenomenal shape, they still wait until their third week for their hell week. I think this lesson is important. Hell weeks can only make sense if the athletes are physically and mentally ready to take it on. Putting unprepared bodies through a training shock can and does result in injuries and demoralization that doesn’t benefit anybody. Some sports teams use the first weeks to work on basic physical movements, essentially the ABCs: Agility, Balance and Coordination. Strength work can be added as well, and overall this can be pretty demanding. This is ideal for land-based training due to the incredible variety of possible activities, but can be done with some creativity in the water as well. The general idea is that significant sports-specific training is put off for a few weeks while the basic building blocks of the athlete are established. The amount of time in this phase is often dictate by how long the particular season for the sport lasts. 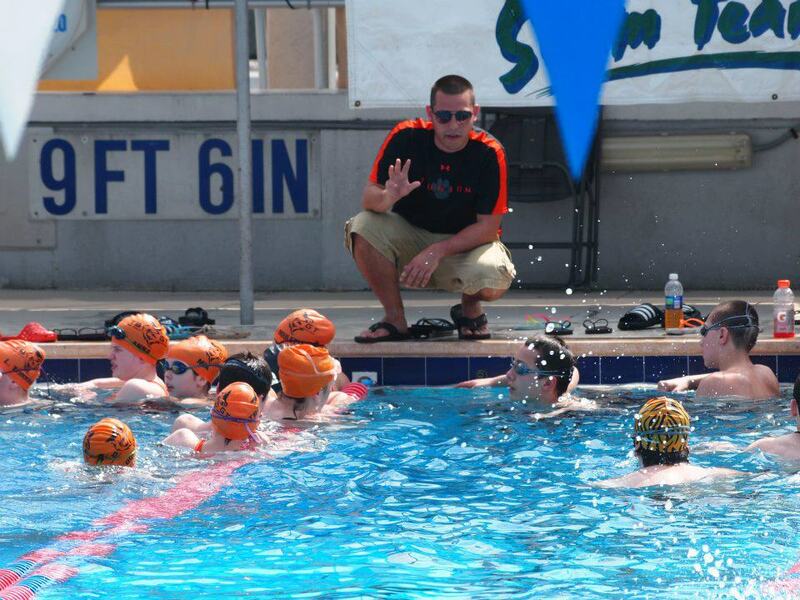 For a swim team this general preparation phase often lasts 3-4 weeks. Many teams with young children start off the season with lots of fun, and easy technique-based activities. To me this sounds perfect, although it can bother the occasional serious young athlete, or the much more common serious parent. However, starting the season more gently is excellent for athletes who have not yet developed an emotional involvement with the sport. It seems that this approach is done the best when technique and general ABC development are embedded in fun-oriented activities that have the kids wanting more. So what did I learn from this activity? First off, a hell week is not for us. Most of our swimmers have had 2 months off, will be relatively out of shape, and will have lost some muscle memory for their strokes (often a good thing as bad habits are forgotten as easily as good habits). Giving them a potentially demoralizing and debilitating volume of work at the start of a 10-month season seems folly to me for so many reasons. Also, my swimmers will already be emotional involved with the sport, and so limiting ourselves to easy and fun activities isn’t productive or rewarding. This leaves some variation of Mix It Up. I love the idea of doing non-swimming-specific exercises now while we works on our ABCs, both in the water and out. Then we can treat the loss of muscle memory as an opportunity to develop proper stroke and turn techniques by doing some focussed technique work. Next, we can provide some base conditioning with lots of kicking and streamlining work. And finally, I’ll need to provide some socialization activities for friends who haven’t seen each other for 2 months, and for new members to feel like they’re part of our team. I guess I really shouldn’t be surprised that this matches how the best coaches I’ve ever had and worked with start their seasons. But it’s good to know how they got there. Next Post How Hard Should We Push our Young Swimmers? I prefer to start with long slow swimming with my bigger kids. Doing things for duration of time intervals and correcting / resetting their strokes seems to work really well. Lots of snorkel work and kicking is involved. For my little guys it is lots of short drill work, and short fast kicking. We have fun and do silly stuff in between for the little guys and have short team bonding stuff for the big kids.